Collect Game Cards from each Manager prior to kick-off. Manager will supply a Smart Phone and login to their Virtual ID Cards. If a JERSEY # DOES NOT MATCH and/or the Player is missing a photo in the Virtual ID Cards, The player CAN NOT PLAY. Do NOT write in or change a Jersey #. IF a DUPLICATE JERSEY # is present. DO NOT CHANGE THE JERSEY #. One of those players CAN NOT PLAY. Have the manager contact the league if their is a discrepancy. Do NOT delay the start of the game. Players that are suspended will appear with an X and lined out on the game card and will be in RED on the virtual ID Card. Club Pass Players will be appear highlighted with a CP next to the player on both the virtual ID card and game card. If the eligibility of a Club Pass Player is questioned, the Manager must contact a league official. DO NOT DELAY THE START OF THE GAME. Club Pass Player must appear on both the Virtual ID card and the Game card and their Jersey # must match. DO NOT CHANGE A JERSEY #. Notate ALL misconduct cards on each game card using the appropriate code and applying to the correct jersey number. Please clearly write all three referees names at the bottom of the game card. Notate final score on both Game Cards. Return Game Cards to each Manager or Coach following the game. LHGCL is no longer requiring MISCONDUCT reports to be sent in for YELLOW CARDS. RED CARDS ONLY! 1) Day Games - player may go to the concession area (if open) for the remainder of the game; report to commissioner, if available, or may leave the complex entirely with a parent or other authorized adult. 2) Night Games - if the player is unable to leave the complex and the concession area is closed, the player may sit on the spectator side with an authorized adult for the remainder of the game. 2) If the coach has a game with another team immediately following the "send-off" game, he has to warm-up his team as far away from the "send-off" game as possible and can have no contact with players or parents involved in the "send-off" game. (1) Ask the coach to speak with the unruly or dissenting supporter to calm the individual down. Wait until the coach or someone from the team, coach, assistant. coach or team manager has spoken to the individual. (2) If the bad behavior persists, Tell the coach again that the offender must be dealt with immediately and if the Irresponsible Behavior continues he and the offender will be asked to leave. Tell the coach that this behavior will not be tolerated. (3) If the coach cannot or refuses to handle the situation then dismiss (Remove) the coach. Advise the remaining team officials that the game will not continue until the coach and the offending spectator(s) leave the field. Do not continue the game until both the coach and the offending individual(s) leave the area. Note: Do not add to touchline distractions by antagonizing coaches and spectators when dealing with incidents originating from the technical area or the spectator’s touchline. When you have to deal with a coach, be cordial, try a few firm but quite words regarding what you expect from the coach and return to the match. If the distraction is a spectator, tell the coach what you want to happen and let the coach deal with the issue. A word to assistant referees – Comments and conversations with spectators do not often end well. At best your good intentions will be poorly received and at worst could lead to dissent and arguments between you and spectators, distracting you from your primary responsibility which is assisting the referee. Be polite and courteous but keep your communications between you and the referee. Defer to them unless situation is too dangerous to wait. Please note, there are trainers on duty on both weekends and weeknights. Commissioners are available on Weekends. Trainers have lightning detectors on their phones and can assist in making the call. 1 long blast, clear the fields; 3 short blasts, ok to return. At the first notice of lightning, clear the fields. Act in unison with referees on the other fields. You must not return to fields until 30 minutes after last lightning. No delays longer than 20 minutes for weeknight games. Abandon game if longer delay is necessary. Ex: first game is cancelled due to lightning. Second game can begin if clear of lightning for 30 minutes or more and the second game will begin no later than 20 minutes past its scheduled start time. Some of our games are DUAL Games, meaning the game they are playing in LHGCL is also a Frontier Conference Match (the old Premier League). The Manager should hand you a specific game card for that match. YOU ONLY NEED TO USE THE FRONTIER LEAGUE Game Card from each team. Also DUAL MATCHES ONLY use the USYS Member Cards for check-in not Virtual ID Cards. Please review the rules below for Frontier Conference Matches. Their rules take priority in Dual Matches. 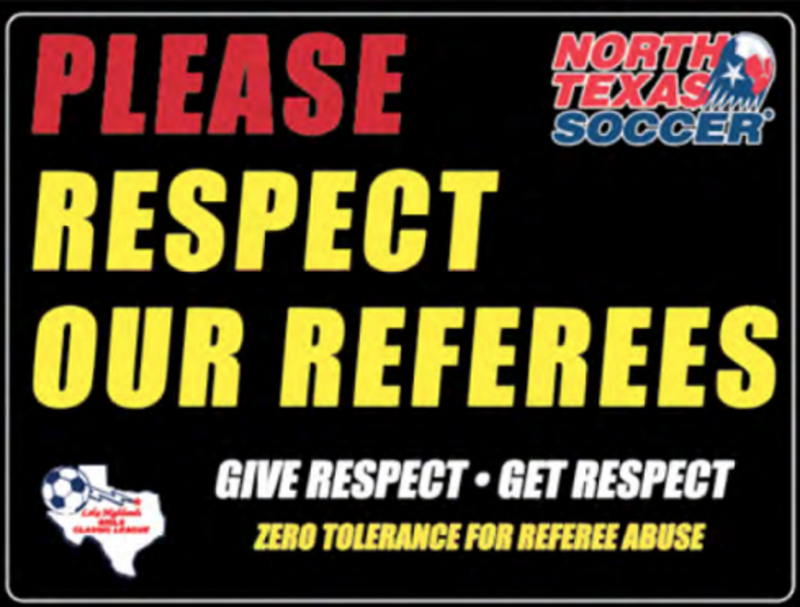 All RED cards must be followed up with a separate misconduct report for each RED card. No exceptions! ©2019 Lake Highlands Girls Classic League / SportsEngine. All Rights Reserved.